37. George "Colby" Brown. Son of Charles Lister Brown & Sarah Ann Jane Dibble "Annie" Patterson. Born 25 Nov 1900. Died 29 May 1972. Occupation Foreman, CPR, Saint John. Colby and Margaret lived in Harvey before moving to Saint John. He was foreman on CPR in Saint John. They had three children: Berna, Raymond Colby and Claude Bain. He married Margaret I. Bain. Born 17 Feb 1899 in Brownville, Maine. Died 10 Mar 1988 in Carleton Kirk Lodge, Saint John. Buried in Cedar Hill Ext. Cemetery, Saint John. 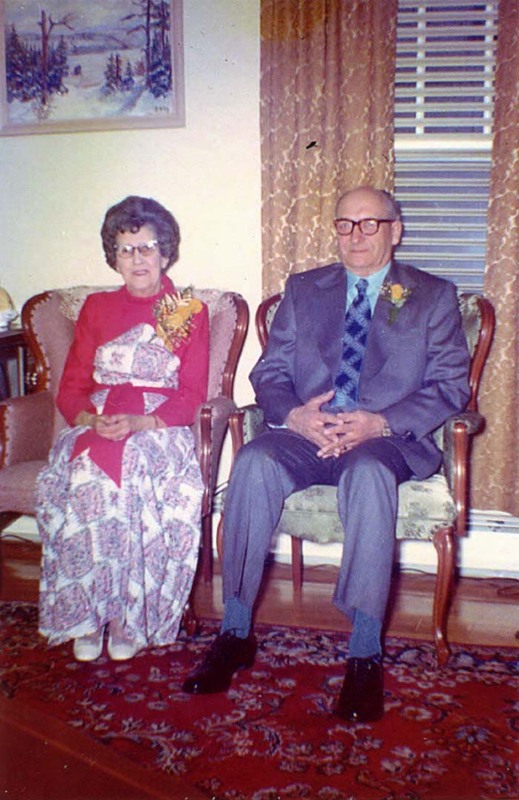 Undated informal photograph of George "Colby" Brown (b 25 Nov 1900; d. 29 May 1972) and his wife Margaret I. Bain (b. 17 Feb 1899, Brownville, Me; d. 10 Mar 1988, Carleton Kirk Lodge, Saint Johnn, N.B.). BROWN: At the Carleton Kirk Lodge on March 10, 1988, Mrs Margaret I. Brown, widow of G. Colby Brown. Survived by one son, Dr. Claude Brown of Oromocto, one daughter, Miss Berna Brown of West Saint John, one sister Mrs Dennis Mulharin of Portland, Maine, two brothers, Gerald Bain of Richmond, Virginia, Claude Bain of Dover, Maine, five grandchildren, six great grandchildren, several nephews and nieces. Resting at the Castle Funeral Home, (Fallsview), 309 Lancaster Avenue from where the funeral will be held Saturday at 11 am. Interment in Cedar Hill ext. Cemetery. Visiting Friday 2-4, 7-9 pm. 101 iii. Claude Bain Brown M.D.